Figured I'd start a separate thread so as not to crowd the SEQ firmware thread with too much Novation BLM discussion. 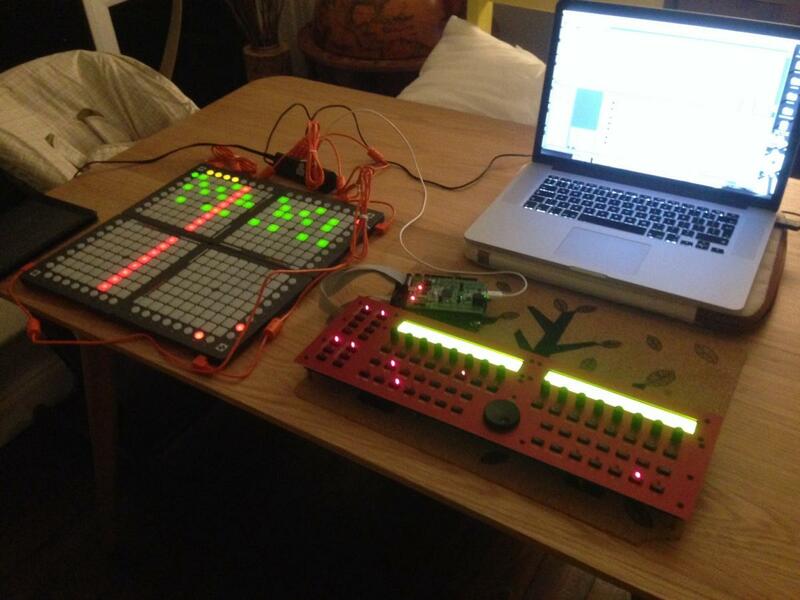 If you haven't been following that, TK introduced support for using two or four Novation Launchpads as a hardware BLM in the latest firmware. 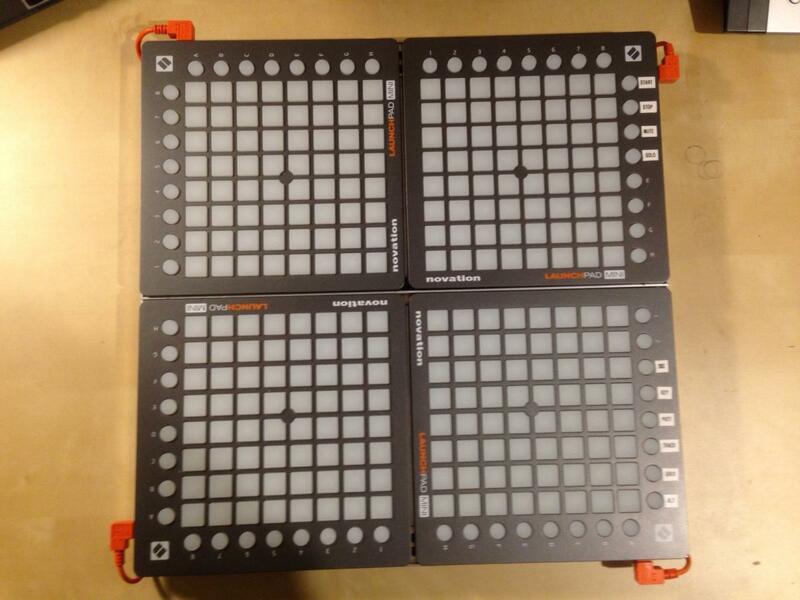 Here are setup instructions for the Novation Launchpad BLM. 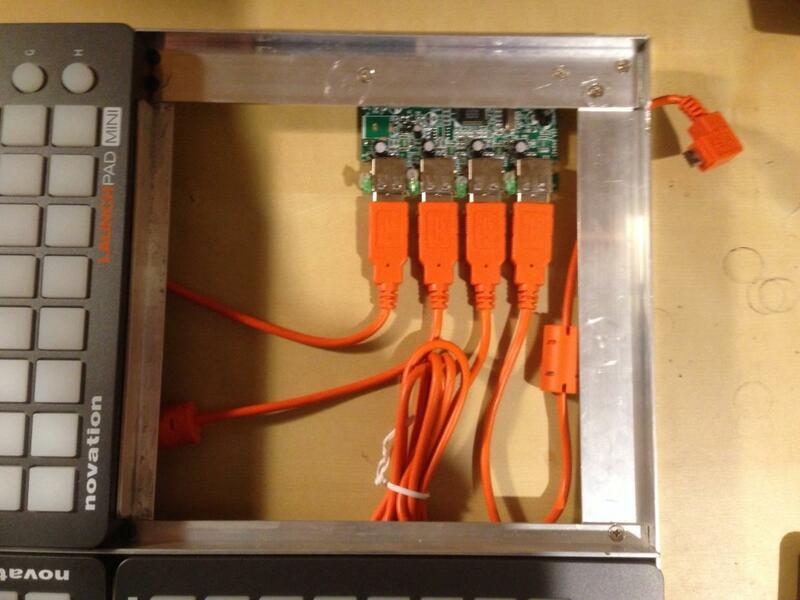 Download the v. 87 pre1 firmware from (or a later version) to make the Launchpad BLM work. Is there any way to disable the start(play) and stop buttons in the BLM? I'm finding that I sometimes accidentally hit those buttons while working with the BLM, unintentionally interfering with playback... Are they really necessary on the BLM anyway? They're available pretty easily on the frontpanel... Dropping them from the BLM would free up a few buttons for other functions. Here's TK's last post re: BLM features from that thread. I can confirm that 4 x Launchpad Mini arranged in a 16x16 matrix works with 4.087 firmware. One feature I think that could do with some tweaking is the way muting/umuting tracks is handled. The current solution where by you press the track select button twice isn't ideal, especially in a performance situation. My current thoughts are that a new mode should be introduced for muting/unmuting. I haven't thought about how it should be implemented yet in any detail. Need more inspirations how it could look like. My initial thoughts after spending some time using the BLM tonight would be to add a "mute mode" on the button above the "303" button in the Extra column on the right hand side. When "mute mode" is active the left hand Extra column buttons become track mute buttons regardless of which mode is active. To extend this idea further a "solo mode" button would also be useful. Mute/Solo Sync "countdown" - LED flashing. Does anyone use the BLM without a V4 or V4L frontpanel nearby? If not, the play and stop buttons could be removed from the launchpad BLM interface to make room in the right column of buttons for more functions. I sometimes accidentally hit those buttons while BLMing and mess the song up. I'd rather they weren't there, and just use the V4 itself to start and stop playback. Do other people find the play/stop buttons useful on the BLM? To elaborate your ideas a bit further: replace PLAY and STOP button by MUTE and SOLO on/off buttons would work, right? 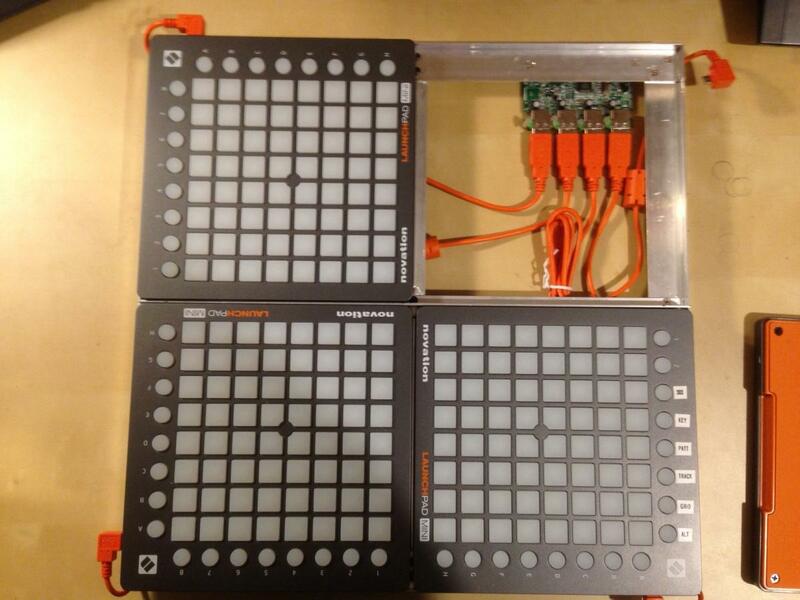 I can't flash the LEDs, this would be too much Launchpad specific, or would generate some (unwanted) MIDI traffic. But I don't want to add more ALT functions. Nobody will remember them in 1..2 months. Use the round step buttons along the top of the launchpad: Get rid of PLAY and STOP. Add MUTE and SOLO buttons. While MUTE is held, the top row of 16 buttons represent the 16 tracks, Muted tracks appear as red. Press MUTE+step button to mute or unmute a track. While SOLO is held, the top row of 16 buttons represent the 16 tracks, Soloed tracks appear as green. Press SOLO+step button to solo or unsolo a track. My initial thoughts are based around a 16x16 matrix so there are 8 unsed buttons between the 303 button and stop button. I understand to make this scalable to a 8x16 matrix only 8 Extra column buttons are available which are all currently in use. The suggestion of replacing the Start and Stop buttons solves this problem rather neatly. I've got an idea as to how full transport functionality could be added at a later stage, but let's not confuse things and deal with one idea at a time. One LED state suggested seems illiogical to me.... I may be missing something here but I can't think of a use case. Funtionally this is the same as Mute Off Solo Off (while another track is Solo'ed). Solo's should also be additive I.e. More than one track can be sole'ed simultaneously. I haven't tried Soloing tracks on the MBSEQV4 itself yet so I don't know if that's the default behaviour. I think the Mute/Solo mode should be on the left hand Extra column replacing the "Track Select" Buttons when active. It would be counter intuitive to have the Mute/Solo buttons on the Extra Row at the top I think. Muting/Soloing should NOT require two simultaneous button presses to activate. If two simultaneous button press are required you would need to use two hands to active the function which wouldn't be ideal in a performance situation. I like the "Mute+Solo - Mute all tracks" idea. Your suggested rearrangement of the button order also makes sense. The thing with adding two dedicated muting "views" is that there are basically only 8 function keys on the right side, since not everyone will be using 4 launchpads... So, the question is is muting and soloing important enough to tie up the last two remaining buttons, or should they be implemented in a way that leaves space for future features? Also, there are a lot of functions already assigned to the right side track buttons, and a lot of LED indicator states are already required there. Those buttons are already pretty "busy". Press BUTTON MODE repeatedly to cycle through these states. Add a "Track Settings View" mode: Well, there's already a track view mode... Maybe call the new view "Settings View". Other columns could be added in the future, as needed... For example: FORCE TO SCALE on/off, FX Delay on/off, HOLD on/off, SUSTAIN on/off, SYNC TO MEASURE on/off, etc. 16 columns of settings would be available. The top row of round buttons (step indicator buttons) could be used to perform bulk actions on the column below - eg: press top button to mute all tracks, ALT+top button to unmute all tracks. When I use the BLM, my SEQ is always close, and I use the frontpanel of the SEQ to do some things (like muting), and the BLM to do other things. If you're not currently using both together, you should try it - there's a lot that you might not realize that the BLM can do... For example, try switching parameter layers on the SEQ frontpanel while you're in grid view on the BLM... Or switch trigger layers on the SEQ while you're in Track View on the BLM (you can also switch trigger layers directly from the BLM in track view with ALT+track buttons). The BLM also makes using the SEQ frontpanel easier in certain ways - eg: using the top buttons to switch step views is a lot easier and more intuitive than using the STEP button on the SEQ frontpanel. Switching the displayed steps on the BLM will also switch the SEQ display. The SEQ frontpanel (especially now after the most recent firmware upgrade, which adds new sync mute to measure functionality) offers a lot more muting and solo functionality than the BLM does. Not everything needs to be on the BLM (I'm thinking transport controls probably don't, for example)... The frontpanel is a great interface once you get used to it, and using the frontpanel and the BLM together is very feature-rich. one day ago I thought that I could add a Mute/Solo feature in maybe 1..2 hours. But the additional feature requests sound like I've to work on this for several days - not at least to satisfy your ideas, get feedback, iterate. The proposed "track settings view" mode sounds powerful, but the information which needs to be displayed (such as several track configuration flags) isn't stored in RAM in a way which makes it possible to pass it to the BLM without loosing a lot of CPU time to fetch the different flags from different variables. Mute and Solo are available as 16bit variables, and can be directly passed without re-arrangements. That's another reason why I would like to focus Solo/Mute. Haha... I didn't mean the list of stuff in the "Settings View" description to be feature requests to implement now, I just meant them as examples of how that view could be expanded in the future. I meant that for now, just two columns (MUTE and SOLO) could be set up, but that that implementation might be better than the others because it leaves a lot of room for more features to be added later. Unfortunately I've no time to add this feature before christmas (even the simple implementation). Note that the Solo function wasn't available this way before. The legacy Solo function only soloes the selected tracks. The new Solo function (which is only accessible via the BLM) soloes the tracks independent from the track selection. Updated emulation app (V1.4) can be downloaded from: http://www.ucapps.de/midibox_seq_manual_blm.html'>http://www.ucapps.de/midibox_seq_manual_blm.html Documentation hasn't been updated yet... Note that the Solo function wasn't available this way before. The legacy Solo function only soloes the selected tracks. The new Solo function (which is only accessible via the BLM) soloes the tracks independent from the track selection. It also has a higher priority than Mute Best Regards, Thorsten. Excellent! I'll try this out tonight. Thanks TK! I've tried out the new V4.088 pre3 firmware are BLM V1.4 app and everything seems to be working as expected. Great idea to keep the play and stop buttons when a 16x16+X configuration is used. One thing I've noticed that now strikes me as a little odd is that the SEQ hardware panel shows muted tracks with the LED below the corresponding encoder lit green while the LED on the BLM is off. Would it not make more sense for the LEDs on the SEQ hardware panel and the BLM to behave the same way as to avoid confusion? I agree, it was a bad decision to invert the mute LED behaviour. As you can see, the red colour makes it easier to identify muted tracks in solo mode. I'll try the new firmware in the morning. 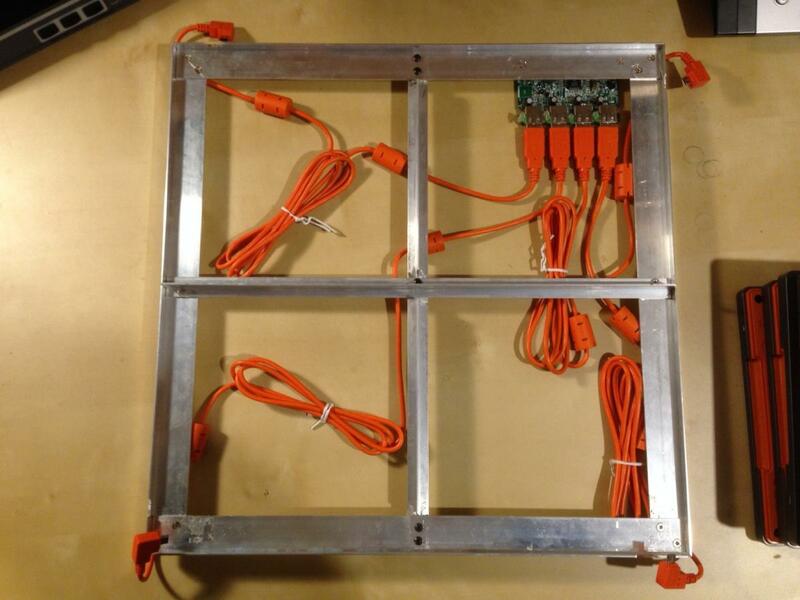 I've made a basic frame today to hold the 4 x launchpads in with a USB hub screwed on to the bottom. - when ALT is held (to switch octaves), round track buttons on the right side light to indicate which octaves have notes set? Should be possible without too much effort.